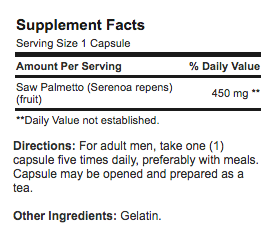 When the product is Saw Palmetto you know the sterol score is going to be low and this lab test shows that once again. Not even 1mg of sterols in a serving. Remember, as I say saw palmetto is a waste and Beta-sitosterol gives you many more sterols than saw palmetto and it is sterols that your prostate needs. Puritans Pride is a big radio advertiser. Seems like they virtually own Saturday and Sunday morning AM radio around the county with their half hour radio infomercials. They have a number of great products, but this one is not so hot. Saw palmetto is a waste of money.